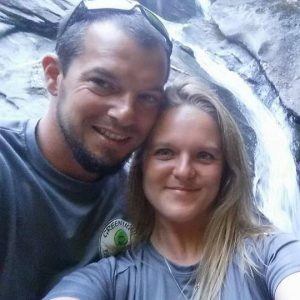 Meet Shaun & Erin of Green Light Disc Golf! With the first tournament on the horizon at the newly redesigned Rapscallion Disc Golf course, we asked our partners at Green Light Disc Golf – Shaun LaForce and Erin Tivnan – to tell us more about what brought them to this point, both as players and tournament organizers with a passion for this growing sport. How long have you played disc golf and how did you learn about the game? Erin: I have been playing since 1997, making this my 18th year knowing about the sport. I learned about it from some friends that did some volunteer work when the course was being built at Buffumville Dam in Charlton, MA. I didn’t play often the first 10 or so years I knew about the game (maybe a few times each year) but I started learning how amazing the local disc golf community was 8 years ago when I started playing leagues and meeting new people that shared my passion for this game. I have made some of the greatest friends in the disc golf community that have become like family. I also met Shaun playing disc golf; we met at a Sunday morning league at Buffumville and the rest is history! Shaun: I first learned about disc golf while going to school at Cape Cod Community College in 2000. There was a 9-hole course on campus, and a classmate brought me out for my first time, and I can honestly say I didn’t like it much. It was more difficult than it seemed. I couldn’t get the disc to fly straight, and I was constantly looking for my disc in the bushes. I didn’t play again until 1 year later, when I went out with a good friend Zach Adams, and his cousin Jake Gould at the Buffumville course. Jake is a talented player and was adamant about getting my friends and I to fall in love with the game, and that he did. After getting the proper discs in our hands, along with some direction on technique, we were hooked! How and when did Green Light Disc Golf start? Erin: We are both long-time tournament players, and always envisioned ourselves being a part of the disc golf scene throughout our lives. As we got older and obligations grew, traveling and playing events week in and week out, became less and less. At this point we felt we needed to seek a different way to continue being a part of it. With disc golf creating so many different friendships and avenues for us along the way (locally and across the country), we felt it was appropriate to give back what disc golf has given us. We had talked about making our dream a reality for a few years but never acted upon it until one day Shaun said he had a name for our dream- Green Light, which to us means “GO FOR IT”. We both immediately loved the name and began thinking of ways we could make it a reality. We decided we would give it a try and ran some tournaments in October of 2014. Since then we have run several dozen events throughout the area and have had tremendous support from the community. How did you go about designing the new Rapscallion course layout? Erin & Shaun: We first met with a group of people at Rapscallion Brewery in the fall of 2015 to discuss the possibilities of a potential redesign of the existing 9 hole course. For us, having the opportunity to design a course in this type of environment was a perfect fit. After months of planning, the train started rolling and we were underway. The course was redesigned with the idea of creating a disc golf atmosphere that was FUN for all, whether you are a new player, or a seasoned pro. We had feedback from A LOT of different disc golfers as we were figuring out the design so we feel that the holes reflect many different types of shots and styles of a player’s game (righty, lefty, backhand, forehand, tight, open, short, long, technical, etc.). The fact that the property had an older course’s footprint made it tricky in deciding how to change it enough to become a true redesign. We also had half the land to work with to start, and wanted to fit 18 legitimate holes. We decided to try walking it backwards to see the land from a different perspective so we wouldn’t just see the “old course”. The first few initial walk-throughs went well but we kept coming up short on 18 holes. We had to keep changing things as we explored new areas, and at the same time, trying to improve upon flow, as well as creating a variety of shots. What excites you about this course and its history that made Green Light decide to partner with Rapscallion? Erin & Shaun: First and foremost, the property, the people, and the environment are what excite us the most about this place. With different types of events throughout each week geared toward young kids and families to young adults/older adults, from familiar faces to new faces, it’s an awesome establishment enjoyed by so many people. Rapscallion is even pet-friendly. Knowing that such a variety of people visit Rapscallion, we felt it was an awesome chance to bring disc golf to lots of new people. It has proved itself so far as we have had so many new players out on the course since we opened. Combined with the simple fact that disc golf once lived here on the property, and knowing how much it had been missed, we were thrilled to have a chance to be a part of the new course. We feel very fortunate to be involved with this project, as working with the staff and volunteers at Rapscallion has been nothing short of amazing! We have a phenomenal relationship with the staff and we have some mighty talented and hardworking individuals that have helped the course come together in such a short time. We had over 1200 volunteer man hours put into the course in a three month span which goes to show the type of team we are working with at Rapscallion Disc Golf! 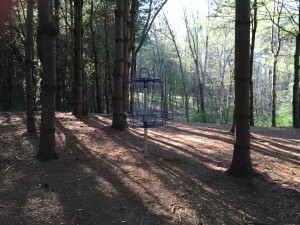 What is the state of disc golf in the area and more so in Massachusetts? Erin & Shaun: The sport has grown in popularity so much since we started playing in the late 90s/early 2000’s. Central Massachusetts has gained a ton of new courses since then and they continue to expand and pop up each year. This is also true for the whole region- there are currently 286 documented courses located in New England, 54 of them in Massachusetts! We are fortunate to have a great local organization with approximately 2000 members; the New England Flying Disc Association (NEFA) that has helped spread the awareness of disc golf, as well as fund many new courses throughout New England. On a larger scale, the Professional Disc Golf Association (PDGA) currently has over 87,000 members which has more than doubled since we joined in the mid to late 2000s. It is amazing that we have so many disc golf players and such a variety of courses now to choose from, and we are happy to have been a part of designing one of them and helping to #growthesport. Where do you see Rapscallion Disc Golf in the future? Erin & Shaun: We still have plenty of items to check off of our “to do” list to get the course to the point we envisioned it when we started the project but overall we are satisfied with our progress so far. Short term we plan to continue to eradicate the poison ivy that has made an unwelcome presence on parts of the land, however we are making steady progress. We have plenty of clean-up and beautifying to accomplish in the future as well but we have a driven, dedicated, and passionate team who shares the same goals and vision. We are looking towards getting a pro shop built on Hole 1 as soon as possible and also some functional hang-out areas for players and spectators to congregate before, during and after a round. We are also excited to announce that we will have 20 adjoining acres to explore in a few years, lending it to endless possibilities of what we could do to make this place even more special. Rapscallion Featured on Phantom Gourmet! A Visit to Our Brewery Captured in 75 Seconds!